Northampton Saints centre Jon Clarke has become the latest player to agree a new contract with the club. 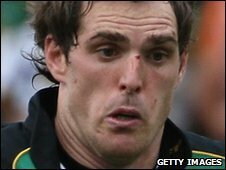 The 26-year-old has scored 26 tries for the Saints in 106 appearances since arriving at Franklin's Gardens in 2003. "I always wanted to stay at Northampton and it's good to know I'll be at a decent club that's going somewhere," said Clarke. "I'm looking forward to the next couple of years and hopefully I can keep playing to a good standard." He continued: "This year is massive for us. We're in the top four in the Guinness Premiership and still in every competition. "Everyone's excited and proud of what's going on. But we've got a long way to go and will have to up our game. "A lot of the guys are signing on again and I don't know why we can't continue to move forward." Director of rugby Jim Mallinder was delighted to see Clarke follow in the footsteps of Ben Foden, Bruce Reihana, Chris Ashton and Roger Wilson - who have committed their futures to the Saints. Mallinder commented: "Jon is an excellent player in both attack and defence. "He always asks questions of the opposition when he gets the ball in his hands, and has the superb ability to defend and win the ball back for us in the tackle. "It's easy to forget that he is still only in his mid-20s so there's no reason why he can't keep improving."